Statistics are very useful at displaying the overall picture of a social trend, a business decision or a historical perspective. But sometimes statistics don’t tell the entire story. 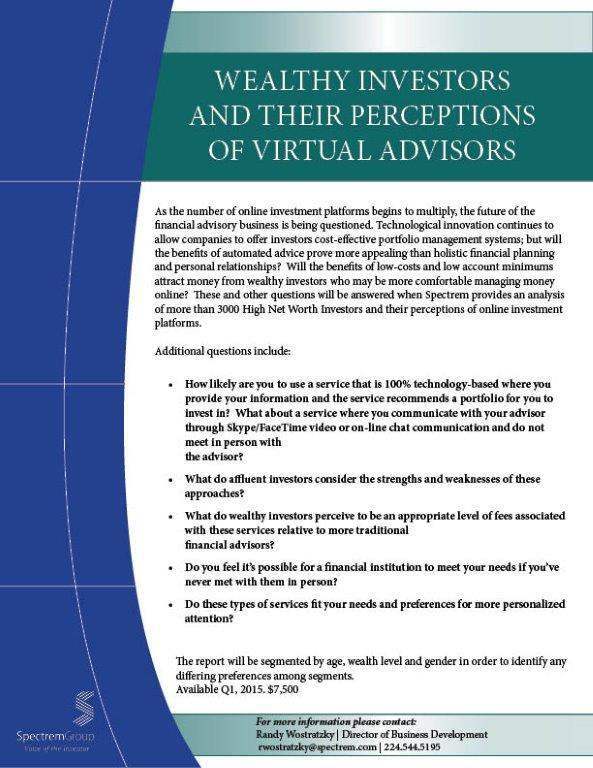 Spectrem’s recent study Wealthy Investors and their Perception of Virtual Advisors looked at affluent investors who use so-called robo-advisors, online services that provide no human interaction while offering investment advice. It also considered investors who use video-chat services, in which they speak to a human advisor through the use of video-chat services such as Skype or FaceTime. They compared those two groups of investors to investors that use the traditional human financial advisor, and showed that there are differences between the two groups, including age and level of wealth. Besides asking questions that could be answered by selecting a choice, Spectrem also conducted focus groups with investors, and asked them their opinions about working with virtual advisors. · While most investors said they preferred a human advisor, they acknowledged that online advisors would be common in the future. · Investors acknowledged that fees for online advisors would be lower than fees for human advisors, although many investors did not know how much they were paying in fees. · Many investors said they might use a portion of their portfolio to test-run a virtual advisor, but that plan flies in the face of the fact virtual advisors make recommendations based on the entirety of an investor’s portfolio. · Investors acknowledged that the comfort with virtual advisors probably was an age issue, and many said they could see their children using a virtual advisor in the future. The Spectrem study concludes that for many investors today, no technology will replace the eye-to-eye contact they prefer to have with their advisor. That being said, the report also indicates that human advisors need to promote the personal aspect of their service so as not to lose investors to less expensive virtual advisors.